I can’t believe that this is my 50th post! And I am truly encouraged that some have left kind words of encouragement to me for the recipes here. You can’t imagine how much I beam from ear to ear when I read that some of my recipes have been tried and tested to satisfaction. It’s very much like how a chef will feel when the food that has been cooked is given the thumbs up or finished cleaned on the plate. Anyway, for the 50th post, I would like to highlight a recipe which my wife shared with me (and cooked for me). She does cook…and she cooks well too. Only thing is that I have persuaded her to allow me to use the kitchen and enjoy my hobby of cooking instead. This dish is tasty as it is hot and spicy whilst at the same time, has a hint of sourness to it (due to the vinegar / lime used). It is also very fragrant due to the quite liberal use of chinese cooking wine. 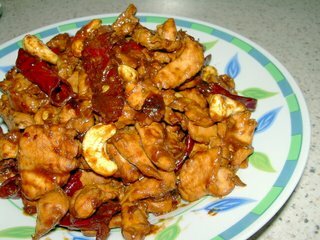 It is a variant of Kung Po Chicken, I believe but tastes slightly different. Adjust the taste according to your preference. That very day when she cooked this dish, we had some cashew nuts at home and she decided to throw some in hence what you see in the picture. It is not in the recipe but you can add it in for extra bite! Pound meat slightly with blunt side of knife or tenderiser. Marinade for 30 minutes. Heat oil in wok, fry the dried chilli for 30 seconds and then add the garlic. Continue to stir-fry till garlic begin to brown. Add chicken and fry till cooked (if you wish to add cashew nuts, add them now). Then add seasoning, stir well until evenly distributed and gravy dries up.